Anyway, the exhibits were excellent as usual, including an Amusement Park theme with a huge working roller coaster, some amazing realistic models in a variety of themes, and some creative art pieces. I brought my Teddy Bear, Kermit the Frog, Kangaroo, California Flag, Galo de Barcelos (Portuguese rooster), and the Sherpa airplane that I’ve been working on (not posted yet). I was pretty stressed out, and didn’t manage to register any of my MOCs, but the Sherpa won one anyway (Committee Favorite)! Check out all the photos of the exhibits on my Flickr album. I also got to participate in several games – I ran one of the speed builds, and I won the “3 in 1” speed build (build all 3 models of a Creator 3-in-1 set faster than anyone else)! I won some great parts as a door prize, as well. They also had an “After Dark” event on the Saturday night, with some additional games (for the adult attendees only) that was a lot of fun, including an X-rated group build contest… my table didn’t win but we had a lot of fun trying, and everyone got some bricks to take home. All told, I probably took home considerably more value in LEGO than I paid to attend. 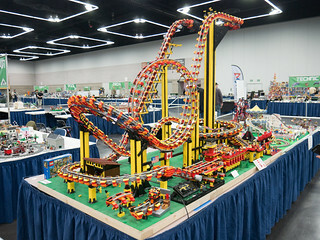 The next LEGO convention I’ll be attending is Bricks by the Bay in Santa Clara, California, in July. Will you be there? That roller coaster is epic! I remember seeing a video on how he made it. Very clever and mesmerising to watch! Looks like it was a good show.